It's almost time! 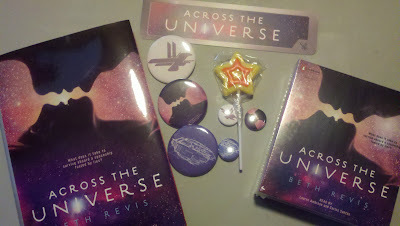 Ohmygoodness, I can barely believe it...it's almost time for ACROSS THE UNIVERSE to be out!!! 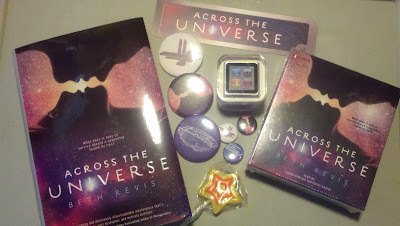 And of course, you guys know me: I celebrate by giving things away! And because I have the very best publisher in the whole wide world (Razorbill! Woot! Woot! ), they are once again joining in with the celebration and offering FIFTY awesome prizes in addition to the three big prizes I'm offering!!! Entering to win the prizes is super easy. All you have to do is take a picture of yourself with your copy of ACROSS THE UNIVERSE. That's it. Just snap a picture and send it in, and you're entered! and (c) that I've not brushed my hair yet. Or my teeth. I'm a slob. But also: I guess this proves that the contest is so easy to enter, you can do it in your pajamas. That little pic of me up there? Totally qualifies for an entry into the contest. If, er, I wasn't already disqualified since I'm the one running the contest. But you know what I mean. First, here's what Razorbill is providing for you--custom made, totally sweet, amazingly cool WATER BOTTLES! 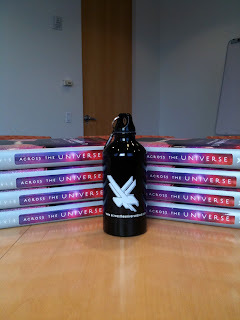 And trust me--when you read ACROSS THE UNIVERSE, you are going to know how very very appropriate this prize is! To win ONE OF FIFTY water bottles (dude! Those odds are awesome! Thank you Razorbill for providing them!) All you have to do is upload your picture to the Facebook Page! You were going to do that anyway, right? Now when you do it, you can win a prize! 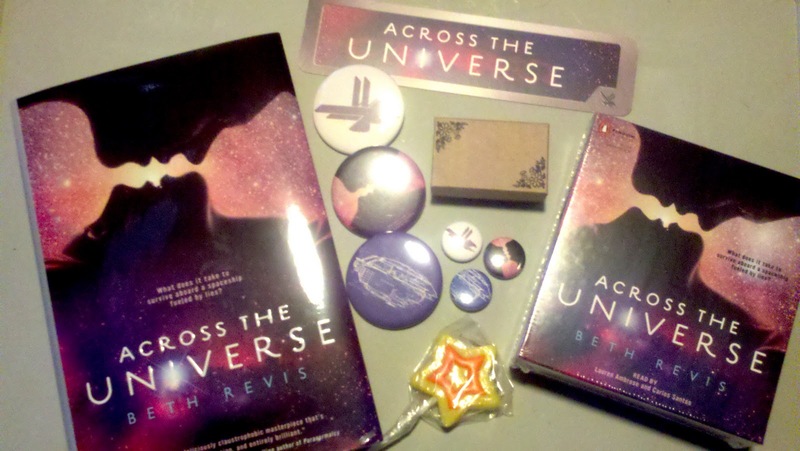 There are also THREE awesome prize packs that you can win! Yup! You saw that right! A multi-touch iPod nano! These little things are so cool--they are small, but they still have the multi-touch screen (like an iPad). I really wanted to include one of these in the prize pack because in my book, the characters use something called "floppies" which is a computer, but the size and thickness of a piece of paper, and the multi-touch controls in the floppies were something I developed in the book after playing with my own iPod. 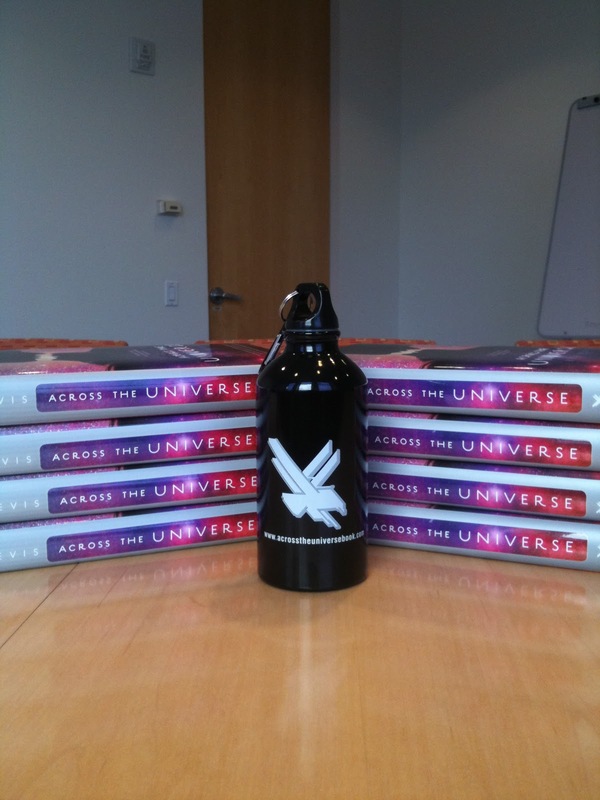 To win the grand prize pack: all you have to do is submit a picture of yourself with the book in some way. If you enter for the Facebook water bottle prize, that totally counts and you're already entered for the grand prize! How easy is that?! If you for some reason don't want to enter the Facebook prize, you can also enter for the grand prize by either posting your picture on your own website, tweeting the picture, or emailing it to me at ATUContest@gmail.com. You guys know I love how creative you are, right? I mean, you guys are pretty awesome, and have come up with some awesome stuff. And, well, I'd love it if I could associate ACROSS THE UNIVERSE with some of your awesome. So I'm doing another prize pack. -Something very cool and very secret that is hidden inside of that little brown box. Only the winner will get to see inside and claim the prize that's there. To win the best picture prize pack: all you have to do is have the coolest picture of yourself. This is going to be totally arbitrary, and totally up to me--whatever picture I pick as being the most awesome gets this prize. You can do anything--you can pose in a cute way, you take the book somewhere cool and pose with it in the awesome location, you can do something neat and have the book with you while you do it--it is 100% up to you, and which ever of you take the most awesomest cool picture, gets the prize! I am seriously excited to see what you can do with this!!! To win the referral prize pack: all you have to do is advertise this contest and remind people to add your name (and website or twitter or facebook or whatever) to the bottom of the form. I'll add them all up and reward one of the top ten referring peeps! All entries must fill out the form below to be considered for the prize (it's how we know who entered and how to contact winners). To win a water bottle, you must upload your picture to the Facebook Page (emailing, tweeting, or blogging doesn't count for that prize). If you upload a picture to the Facebook Page, that entry counts for the other prize packs, too--you only need to take and upload a picture once; you don't have to upload anywhere else. If you don't upload your picture on Facebook, either email a copy to ATUContest@gmail.com or include the hyperlink in the entry form. 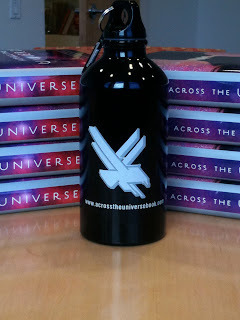 The prize packs with Beth are international; the water bottles are US only. The picture must be taken with a final copy of the book--ARCs don't count. You can display either dust jacket you want (the kissing cover or the blue print cover) as long as it's a picture with the actual physical book. 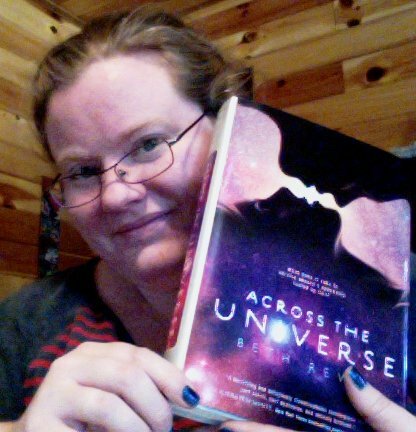 Taking a picture in a bookstore doesn't count--ACROSS THE UNIVERSE wants to go home (or on an adventure) with you! eBooks count! Just make sure to show the book on the screen of your eReader in the picture. The winner of the best picture is up to me. No whining. One entry per person--but one person could win multiple prizes (i.e. you could win a water bottle from the Facebook contest and still win a prize from me, or you could be randomly selected for one prize and still win the best picture or the referral prize). Oh, wait. Yes, it is. That's all. Except for the entry form!! PS: Thank you, Kiersten White, for letting me use your super-cool contest idea! Questions? Post in the comments section here and I'll answer! Awesome contest. I'll be back after I go buy the book next week. I have no idea how you come up with these incredibly awesome contests, but I'm very happy about it. I'll be running out to get AtU on the 11th and picture taking will commence. I'm already thinking up some ideas. This is hilarious and amazing and stupyfying. What a contest! What book! What a writer! OMG, just when exactly is Across the Universe available in Germany??? Dear God Woman, how do you manage to sleep at night? You are sooooo close to launching now! I imagine there is much squealage in your household right now! You really know how to throw a party girl! :0D Thanks for the contest. You went from epic to epicer to epicest. Gotta get my copy of the book and return with a photo! Amazing contest, Beth! Looking foward to getting a copy soon. Happy wishes to you on your upcoming release! That is a definitely a giveaway contest with MORE EPIC! When is the cutoff?? I have a really awesome idea for the contest. But mostly I just want to read ATU. And I still have to wait. WOW. That is some AMAZING swag. So freaking awesome. What day is the 11th? Tuesday? Awesome. Expect my entry Tuesday night. I am excited for your giveaway! Thanks Shannon! And happy to meet your you and your blog! Can you tell I'm excited? I can't stop using exclamation points! OMG... those penguins in your sidebar... I about died laughing! C'mere ickle pengie! Phew...I'll be back to enter. I'm still waiting for my book. Dang it!! I entered! I posted on the FB page...I almost didn't want to enter for the water bottle just because I was afraid of people stealing my idea, lol. And thanks for having all of these great giveaways! Best! Good luck with your book. If you ever need a blogger and or bookseller to rview it, just let me know.